Luminaries from the worlds of medicine, health communications, and information sciences came together for the Friends of the National Library of Medicine 2011 Annual Awards Gala. 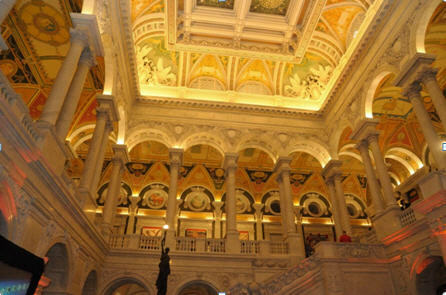 The ornately decorated Great Hall of the Library of Congress, designed as a tribute to American scientific inquiry and discovery, made for the breathtaking and fitting setting for the November 3 event, which celebrated individual accomplishments and acts of leadership in advancing health. 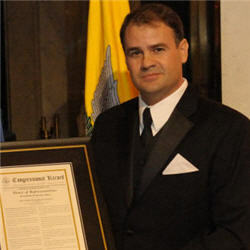 Special guest, Michael Lemole, MD, was honored with a congressional citation at the gala “for his outstanding commitment to improving health, his exemplary career in the field of neurosurgery, and his skillful actions that helped save the life of Congresswoman Giffords.” Dr. Lemole was one of the surgeons who operated on Congresswoman Gabrielle Giffords after she was injured in a gunman’s attack last January. 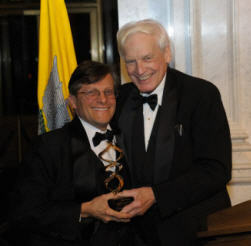 Purnell Chopin, MD received the Distinguished Medical Service Award for his accomplishments as president of the Howard Hughes Medical Institute (HHMI), one of the world’s largest nonprofit medical research and philanthropic organizations. During his 12-year tenure as president, the number of biomedical researchers at the HHMI more than tripled from 96 to 330, and the organization’s budget expanded by than 700% from $77 million to $556 million. These accomplishments enabled important discoveries in biology related to major diseases such as diabetes, heart disease, cancer and others, and establishment of a scientific education grants program. 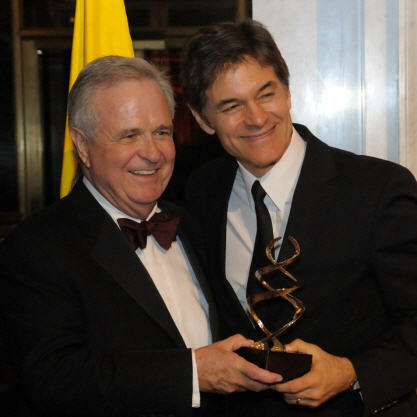 Mehmet Oz, MD and Michael Roizen, MD were given the Paul G. Rogers Health Communications Awards. Dr. Oz is Vice-Chair and Professor of Surgery at Columbia University, director of the Cardiovascular Institute and Complementary Medicine Program at New York Presbyterian Hospital, and hosts a daily television show and a radio show. He is also a regular columnist for O, the Oprah Magazine and Esquire. Dr. Roizen is the Chief Wellness Officer at the Cleveland Clinic, and a cofounder of RealAge, Inc, where he still serves as chair of the scientific advisory board. He completed his residency in anesthesiology and also a fellowship in pharmacology at the National Institutes of Health. Drs. Oz and Roizen are prolific authors, and have co-authored a series of best-selling general-audience health books, beginning with You: The Owner’s Manual. 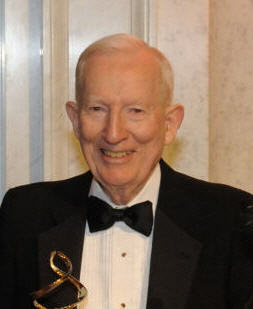 Larry Ellison received the Distinguished Medical Informatics Award. Mr. Ellison is Chief Executive Officer of the Oracle Corporation, a role he has held since founding the company in 1977. Oracle was the first producer of commercial relational database management systems, and it has been a leader of innovations in the industry ever since. The Ellison Medical Foundation, founded by Mr. Ellison in 1997, supports basic biomedical research focused on preventing age-related disease and disability. He was unable to attend the gala. 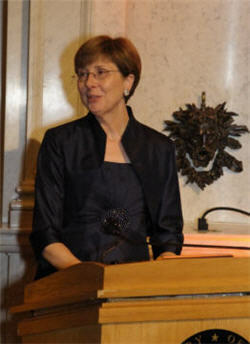 Ann Duesing, MLS received the Michael E. Debakey Outreach Librarian Award for her work at the University of Virginia’s College at Wise. In her role as the outreach librarian at the university, she has been meeting community health information needs in southwest Virginia community since 1995. She has provided point-of-care reference and information services to patients and health providers at free large-scale medical clinics, lead efforts to inform and educate the public about the facts and importance of clinical trials, and developed a partnership that pairs high school and college students with caregivers for those with Alzheimer’s and other conditions to provide training on MedlinePlus and other information tools. If you know any fantastic medical librarians who are providing outstanding service to rural or underserved communities, you can fill out a nomination form for the 2012 Debakey Award. Nominations are being accepted until February 15, 2012. Photo captions from top to bottom: Library of Congress interior; Michael Lemole, MD; Purnell Chopin, MD; Mehmet Oz, MD (right) and Francis J. Bonner, Jr., MD, FNLM president; Michael Roizen, MD (left) and Donald West King, MD, FNLM chairman; Anne Duesing, MLS. Photos by Michael Spencer. January 19, 2012 in Events, People.